It’s the 2015 League of Legends World Championships, and Marcus “Dyrus” Hill is struggling to give his final speech as Team SoloMid’s top laner. Technically speaking, his team has already been knocked out of the tournament a few games ago, but with this final, no-stakes loss to the Chinese team LGD Gaming, it looks like Hill won’t even go out on a high note. Standing on the stage with the broadcast reporter Eefje “Sjokz” Depoortere, Hill is at a loss for words. He scrunches his nose to keep from falling apart after her first question. 4.2 million people are watching around the globe. Throughout his final season, Hill has been stretched to his breaking point. The forum posts blaming him for TSM’s struggles have shot his reputation. His undeniable misplays at the World Championships have shot his confidence. He’s poured out everything, focused all his emotional energy on winning, and now that it’s over, his composure finally gives out. In front of hundreds of European fans, an ocean away from home, Hill breaks down crying. Depoortere places a hand on his shoulder. For a second, the room goes quiet, and then, in a moment worthy of any all-time classic sports reel, the crowd starts chanting Hill’s name. He looks around the room, lifts up his hand, and smiles. Two years later, this is not the moment he remembers when he looks back on his retirement. As a kid growing up in Oahu, Hawaii, Hill mostly kept to himself, and he’d opt to stick around in his room getting good at games like Halo 2 and SOCOM: US Navy SEALs instead of playing outdoors with kids from the neighborhood. Eventually, he spotted an ad for League of Legends and climbed to the top with his two favorite champions, the hard-hitting hypercarry Jax, and the poison damage-dealing top laner Singed. In the higher ranks, he became known for two things: his “trolly” tendencies like binding the laugh emote to a button on the keyboard and spamming it, and his penchant for raging in ranked games when his teammates didn’t carry their weight. Outside of League, Hill finished high school and like most other people his age, struggled to adjust after graduation. During the day he’d work at his dad’s plumbing company as an apprentice – a job he hated – and at night he’d hop on Ventrilo game chat with high-profile players like Dan and Andy Dinh, slowly working to become one of the world’s best League players. Despite his skill and popularity in the community, Hill’s day job and slow Hawaiian internet put a hard cap on his ability to reach pro status. But his friends were out making moves, and eventually, Andy invited him to come live in his gaming apartment in New York. After playing in the house for Andy’s brother Dan’s team, a spot opened up on TSM, and the rest of Hill’s career took off from there. “When I started out, I just played for fun,” Dyrus says. In those early days, it wasn’t just about winning or losing: it was about the sportsmanlike drive to “play, have fun, face off against good competition, and have a good match.” That motive, still uninhibited by corporate interests and multimillion-dollar stakes, gave Dyrus and TSM a symbolic grassroots magnetism that was hard not to root for. When it comes to iconic teams, basketball has the ’95 Bulls, baseball has the ’98 Yankees, and League has 2013 Team SoloMid. It may not have been the best TSM roster from a raw skill standpoint, but the team dominated the NA scene and came to embody the League zeitgeist in all its chaos and excitement. At the time, nothing was established, organizations worked like dysfunctional families, and “esports” as a whole felt like a grand experiment that could fall apart at any moment. In those days, Hill would show up to World Championship games in a t-shirt and light-wash jeans, and it seemed perfectly normal that Andy Dinh – now listed on Forbes’ 30 under 30 list for gaming – could successfully pull off triple duty as TSM’s mid laner, coach, and owner. Even though the League audience was massive enough to sell out the Staples Center in less than an hour, there existed few organizational barriers between team and community. 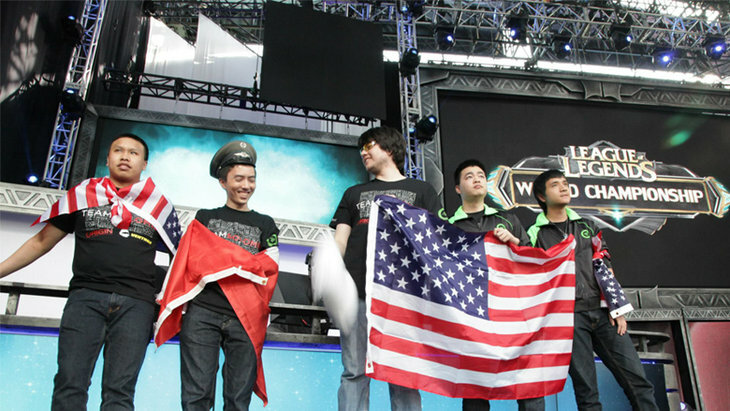 “It was kind of the glory days,” former TSM jungler Brian “TheOddOne” Wyllie tells me. He and Hill always got along as teammates, and back then, they lived in a post-graduation nirvana where all they had to do was play League, hang out with friends, stream, and ignore everything else. One time, Wyllie tells me, the team’s swimming pool turned green; not because they forgot to hire a pool guy, but because they didn’t even realize it was something that needed to be done. Another time, Hill accidentally left a meal in the microwave for 40 minutes (thinking he’d set the timer for four), and went off to take a shower. When he got back, the kitchen had filled with smoke and a swarm of fire trucks were waiting outside. Over time, the structure of TSM and League of Legends as an esport would evolve into something altogether more buttoned-up: Andy stepped down from his spot on the roster and became Hill’s primary confidante, and TSM grew into a marquee brand across multiple high-profile games. But while the scene’s stakes began to skyrocket, Hill’s demeanor stayed the same, and soon enough, League of Legends had grown into something bigger than he was ready to confront. In season four, Hill’s self-proclaimed best era as a player, success came accompanied by loads of bottled-up stress. According to Hill, that season, he tunnel-visioned so hard on winning that it damaged his ability to communicate with his teammates. “It was like balancing between being really toxic and good, or getting really good, and getting complacent and then falling behind again,” he says. With Hill’s mediocre performance during the group stage of the World Championships, the armchair pundits of Reddit had officially turned on him. It wasn’t 2013 anymore, and slipping up on the international stage meant shaming the region and reneging on the unwritten contract a fan enters into when choosing to support a team. People called for his retirement. In a lot of ways, the initiative he takes in opening up is a sign of personal growth for Hill, and his old reflex to leave frictions unexamined is something he’s worked a long time to fix. “If I knew [back then] what I know now in terms of recovering and resetting my mindset – whether it’s drinking a coffee or getting a massage, or just stepping back and instead of focusing so much on mechanical play, focusing more on team play, it could have been a lot different,” he says. He’s practicing that new mindset outside of his stream, too. When it was announced just a few weeks ago that Hill would be playing on Echo Fox’s low-commitment, ragtag Challenger Series team with other beloved former pros like Joedat “Voyboy” Esfahani and Michael “Imaqtpie” Santana, it was hard to tell whether the group would destroy the competition or fail miserably. So far, the team’s win percentage suggests the latter, but even when Dyrus fails to dominate in his former top lane role, his instinct is to reach out, to put his mental roadblocks in words, and to address his stress the moment he feels it. “Sorry for the games, I’m just gonna get off now,” Hill tells his teammate Joedat “Voyboy” Esfahani after a demoralizing duo-queue game where he finishes with one kill and eight deaths. “Don’t sweat it, man. We’ll get it next time,” Esfahani replies. But Esfahani is still on the call.